A remarkable craftsman has gone on up the trail. A block down Main Avenue from my newspaper office, Preston Thompson Guitars produces some of the most highly regarded guitars in the world, recreating the sound of golden age Martin Guitars. After nearly a year of battling serious illness and severe complications from a major surgery, Preston succumbed this morning. Preston was an exceptional man with an extraordinary passion for an American classic. I am deeply saddened by his passing, but also certain that his legacy will continue through the work of the excellent team of craftsmen he assembled to meet the burgeoning demand for his instruments. From about 1929 to 1939, Martin Guitars found a sonic sweet spot. A combination of access to excellent tone woods, excellent design and painstaking attention to detail in a factory setting created a golden age in acoustic guitar-making. 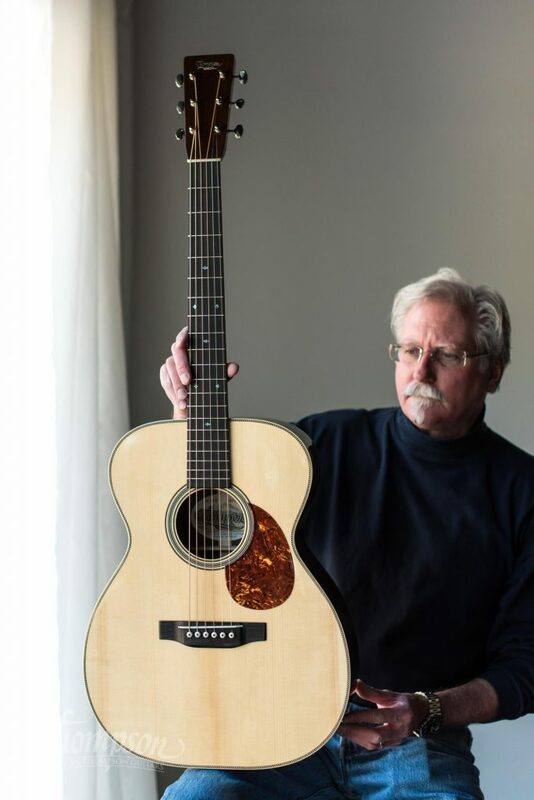 Guitars made in this period have had lasting appeal and fetch tens of thousands of dollars from musicians in pursuit of their unique vintage sound and from collectors who value these supreme examples of the luthier’s craft. Thompson recreated that golden sound in his workshop in Sisters. It was a return to work he did in the 1970s. The late, great Charles Sawtelle of the seminal “newgrass” band Hot Rize was a friend, and helped Thompson in his 1970s exploration of the vintage Martin sound. “Charles had a great collection,” Thompson recalled. Thompson studied those vintage guitars intimately, and started producing his own instruments based on the 1930s Martins. The vagaries of career took him away from guitar-building. He sold off his equipment and worked for Sunriver Resort in Oregon from 1987 to 2001, part of that time as marketing director. Then he worked for Black Butte Ranch, just up the road from us, for four or five years. “After that, I decided to get back into it,” he recalled back in 2013. The Internet played a key role in the revival of his guitar-building career. People were finding his 1970s and ’80s guitars, and were on the Web searching for their maker. “Those guitars were out there working for me,” Preston told me. A couple of people who believed in Preston and his work helped him get set up with a workshop here in town, and the business took off. It employs nine people, most of them expert craftsmen who share Preston’s love for the classic instrument. Last I heard, they built something like 140 custom guitars in 2018. Some of the best bluegrass pickers in the world wield a Thompson Guitar. What happened to Preston Thompson is proof that life ain’t fair. Everybody that knew him, everybody who ever played one of those guitars, feels a loss. But not everyone gets to leave a legacy behind that literally strikes a chord all around the world. Preston Thompson did that. Hats off to him. Chris Luquette gave a heart felt eulogy tonight for Mr. Thompson in Ashe County, NC at a live performance playing his “Preston Thompson” guitar with “Frank Solivan & Dirty Kitchen”. From the mountains and heart of the highlands of North Carolina and the blue grass country we salute you and your work Mr. Preston. Our thoughts and prayers and condolences for family and friends and loved ones…. thank you for your gifts to the world. Preston made a guitar for me when I was in hospital battling the cancer demon, and I am quite convinced that the beautiful instrument he made was a factor in my survival. It is a work of art that makes music, and I believe he understood the power of his art. Now, all of the Preston Thompson guitars scattered around the planet will resonate in tribute to his work. Music is a mighty force. Thanks Bill. I have no doubt you are right. Sorry for both your and all of Sisters loss as well as acoustic guitar lovers everywhere. Talent is very dense in Sisters no doubt. This will certainly continue as a legacy and long lasting tradition in Sisters with production carrying on…. Preston had such a generous heart, and he always tried to make things right for everyone concerned. His vision and efforts in all things made the world a better place. He will be missed. Good to hear form you Katie. Too much loss lately.